The origin of buttons is difficult to establish, but the word itself probably stems from either the French bouton for bud or bouter to push. The French were passionate about the potential of the button and by 1250 had established the Button Makers Guild. The Guild produced beautiful buttons with great artistry, much to the delight of the aristocracy. The peasants, however, weren’t allowed to join this button fest, even if they could afford it. The aristocracy passed laws to limit buttons permitted for common usage to thread- or cloth-covered buttons. Jump seven centuries to the twentieth century, and fabric covered buttons hit great heights in popularity, particularly self-covered buttons. In the garment industry, the term ‘self-covered buttons’ refers to buttons that have been covered in the same fabric as the main body of the garment, whereas in haberdashery terms, it generally alludes to the kits you can purchase in order to make fabric covered buttons at home yourself. 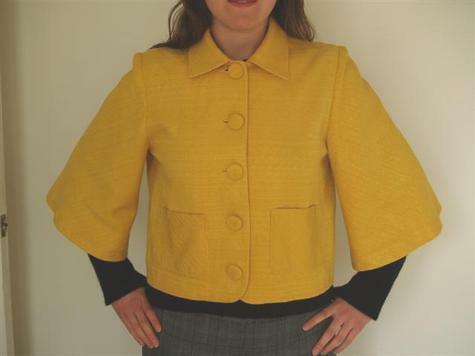 I believe self-covered buttons reached their zenith of popularity in the 1960’s, particularly on women’s outerwear (jackets and coats) and dresses. However, over the last four or five years (in the UK high street at least) self-covered buttons have regained popularity and presence. I find it interesting that what once begun as a lowly fastening for peasants, became used to create a polished, sleek and subtly elegant finish to a garment. In fact, from my experience working in clothing companies, including fabric covered buttons to a garment design adds a fair amount to the total costing of its manufacture, as standard plastic buttons are way cheaper. When home sewing is concerned, I don’t know about you, but I find adding a detail that aids the polished finish of one of my creations is no bad thing! There are two choices out there if you are interested but haven’t as-yet indulged. You can either find a company that will produce covered buttons in your own fabric for you, or you can buy a kit and DIY. If you are choosing the latter DIY approach, you should find kits to create basic domed fabric covered buttons in a variety of sizes easy enough in your local haberdashers, on eBay or other online suppliers. They consist of a dome shape and a backing that has the shank, and can come in metal or plastic. Personally, I have had mixed results using these kits, but I would heartily recommend using Gertie’s how-to tips for a successful outcome. 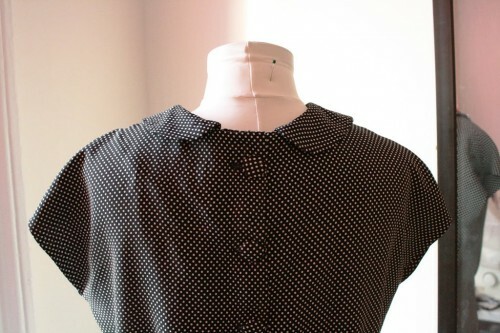 Her stunning Sencha blouse, pictured above, looks so neat and well crafted with its row of DIY self-covered buttons. If you chose to go the professional route, you will need to either find a company that you can physically visit (like the amazing DM Buttons and Buttonholes in Soho, if you live in or near London, for example) or a company that you can post your fabric to and will send back the finished items (like Gertie did for the self-covered buttons for her winter coat project). From my experience of dealing with DM Buttons, you get more choice in terms of size and style (DM Buttons offer Dome, High Ball, sew-through or Marigold styles) and slicker results. This is not to say that I have not been pleased with the outcome of the DIY kits, on my yellow jacket pictured above, for example. Of course, there’s no rule to say that you must stick to self-fabric when covering (or getting covered) buttons, in precisely the same way that there is no need for your buttons need stick to the garment base colour at all if you decide otherwise. You could pick out a solid colour for the buttons for a garment made in a busy print, or vice versa. And lots of fun can be had if using a novelty printed fabric (see my attempt above). If you fancy the look of contrast buttons, but don’t have either the fabric or inclination, there are many fantastic handmade options available from etsy, like the super-sweet bird set pictured below available here. I’ve been a fan of the self-covered button for years. My mom used them a lot, as did my grandmother. My mom taught me when using a thin fabric, it is best to place a thin lining of the most dominant color of the fabric for the button in between the metal dome and the outer fabric. This will stop the metal from shining through and ruining the appearance of the button. I love the little birds and kids faces, very nice! I didn’t know about DM Buttons in Soho. Another place I must put on my list of sewing venues to visit. Thank you! I love the idea of covered buttons and might be able to work them into a current project. Vogue Fabrics in Evanston, IL, will also make fabric-covered buttons. Just supply the materials! The variety available is amazing – call the store for details. Oooh I lurve the little birds, so cute! I have a set to cover buttons that was handed down by my aunt, but I’m waiting for the perfect fabric to make some. That historical section seems more fantasy than reality :-). It seems pretty clear that buttons as such had an Asian origin. While buttons did start appearing in Europe (along with fitted clothes) when people came back from the crusades, around the 13th century, they didn’t get really popular till the 17th century in France. And then they were mostly expensive works of art, so out of bounds to many for economic reasons, but there were never any laws restricting them (in France). It’s not till the 19th century that they got really widespread in Europe. Here is a link for a summary: http://www.boutons-mercier.com/Histbt~1.htm or even in English http://en.wikipedia.org/wiki/Buttons. You could also take a look at Buttons by Diana Epstein and Millicent Safro, owners of the great shop Tender Buttons in NYC, you’d learn a little history along with seeing some magnificent antiques. Great post. 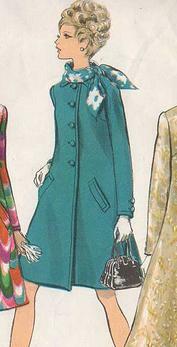 I would love to make that turquoise coat in the middle. Wow. I’ve been waiting my whole life for that. 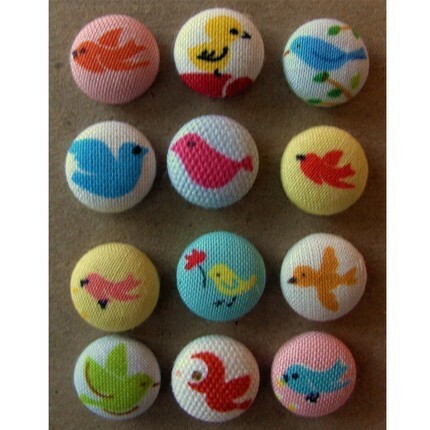 we have many kinds of fancy fabric covered buttons. they are all very beautiful. Very interesting post. 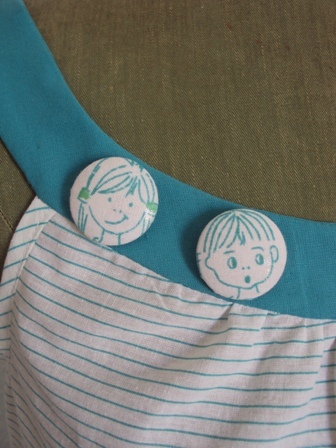 I agree that fabric covered buttons can add flair to any creation, not just clothes. Use them on duvet covers, cushions headboards and lots more. I love them so much I make them for sale. From cashmere knits to embellished fabrics, there are no limits to the humble button! Amazing it is very beautiful. it is main part of body garments. it’s wonderful benefit is it available with garment match. Covered buttons is very beautiful and fantastic buttons . it improves our personality. Thanks for sharing pictures and information.